John Cage & the New World Symphony! 4'33" is Cage's most famous and still controversial work. Composed in 1952 for any instrument (or any combination of instruments), the three-movement score instructs the player NOT to play a sound for the duration of the piece. The first movement lasts 30'; the second 2'23", and the third 1'40". The work, commonly referred to as "four thirty-three," consists of only the sounds of the performance environment. From February 8-10, the New World Symphony will host a spectacular three-day festival dedicated to the music and ideas of John Cage, entitled Making the Right Choices: A John Cage Centennial Celebration. You are invited to attend, and to add your creative genius to the event! In addition to three evenings of concerts, NWS will host a video installation entitled NWS: 4'33", created by artist Mikel Rouse, which will consist of contributed video performances. Record and submit your video, then visit the installation during the festival to see your work in the SunTrust Pavilion. The selected videos will also be used in an online archive of the event, so your recorded contribution may become part of a lasting tribute to this defining and seminal artist. *Create a video recording of your performance. Adhere to Cage's original timings for each of the work's three movements -- 30", 2'23", and 1'40" -- keeping your performance as close to 4'33" as possible. Please don't incorporate any sort of verbal introduction (it's not needed here!). *Once your video is live on YouTube, go to the NWS: 4'33" YouTube site and click on the "Subscribe" button. Your video will be screened and added to our Playlist. For those of you unfamiliar with (or skittish about) YouTube who would prefer to submit your video in another manner, please contact NWS433@gmail.com. Notice: The submission of your video recording constitutes your legal permission to use it, without limitation, public recognition, or financial compensation, if, in fact, it is selected for us in the NWS: 4'33" video installation. The NWS 4'33" video installation will be presented during the New World Symphony's upcoming festival and as part of an online presentation of the festival that will be developed for future viewing. Here's a retail concept that "No Logo" champion Naomi Klein might approve of — maybe. 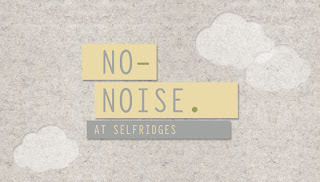 Britain's fabled Selfridges department store is ushering in the new year with a vow of silence. The "Best Department Store in the World" (according to last year's Global Department Store Summit in Paris) is rolling out a "No-Noise" concept to its flagship stores including London starting January 7th and running through the end of February. As part of the promotion, they're even convincing brands to strip their logos in an attempt to reduce visual noise for shoppers. Some of the "de-branded" items on offer include Levi's 501 jeans and the pricey Crème De La Mer face cream line. According to Selfridges' blog post, "Some of the world’s most recognisable brands have taken the admirable step of removing their logos in our exclusive collection of de-branded products, available in the Quiet Shop." And it's not just about logo-free shopping (or shhopping, as the case may be), as there will be art and meditation, along with food and music, to clear the mind. The iconic retailer's blog post continues: "We’re reintroducing our Silence Room – an idea first dreamed up in 1909 by Harry Gordon Selfridge" and curating "the best of minimalist design and teamed up with (mod meditation purveyor) Headspace and (returning lit wits) The Idler (hosting "Idle Sundays" throughout the event) to help you find balance in this fast-paced world." To make sure these minimalist spaces serve as tranquil zones, customers will be asked to leave their cell phones and other digital disruptors at the door, along with their shoes. In return, Selfridges will offer "in-store meditation sessions and pods to deliver mindful messages and meditation practices." For added inspiration, "we will also be showcasing specially commissioned art installations in our windows and staging performances to nurture the imagination, including a performance of John Cage's 4'33" (silent composition)," which will take place on February 23rd. According to Selfridges creative director Alannah Weston, the silent shopping space "invites customers to find a moment of peace in a world where we are bombarded by a cacophony of information and stimulation." And there will be food for thought, too, as the store is introducing No-Noise "special menus in restaurants (and) mini nutrition clinics, serving fresh juices and sampling organic and biodynamic wines. Don't forget to visit the WAGfree Pop-up bakery, which specialises in delicious wheat and gluten-free goodies." Follow on Twitter at #nonoise — as you ponder (along with writer William Gibson) whether shoppers will pay a "premium for de-branded designer goods." As for what Mr. Selfridge himself might think of all this, British TV viewers will get a chance to ponder that starting on Sunday, when ITV debuts its new original series about the department store's founder, starring American actor Jeremy Piven as Harry Gordon Selfridge.